Since 2004 gear manufacturer Gossamer Gear has created the lightest and most efficient gear ultralight for backpackers and peakbaggers. 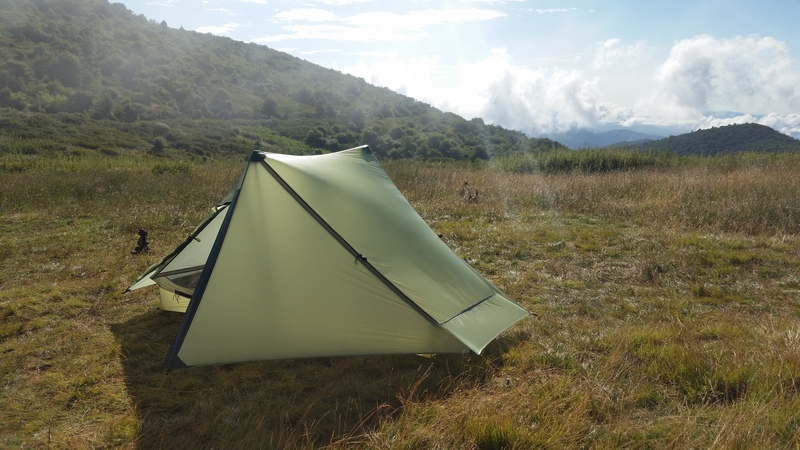 One of the pioneers of the ultralight movement in backpacking, the well known and well touted gear manufacturer has carved out a space in the heart of long distance backpackers. 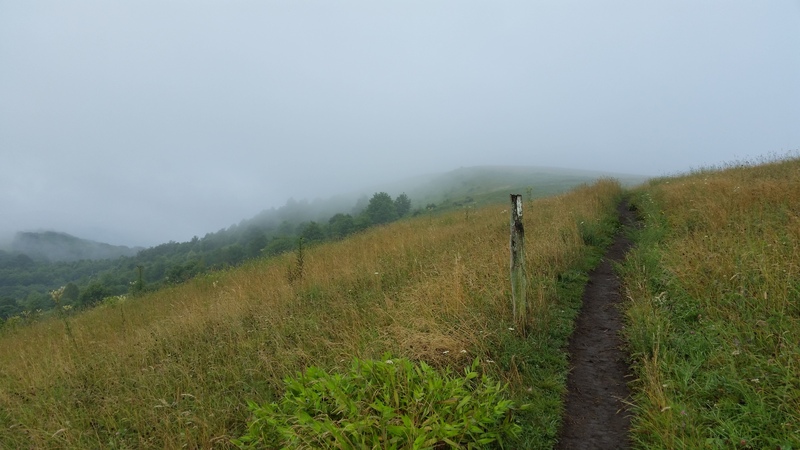 In 2015, Heather “Anish” Anderson carried the Gossamer Gear Gorilla down the 2,189 mile Appalachian Trail in a record breaking 54 days. In 2016, Thomas “The Real Hiking Viking” Gathman also used the Gorilla to haul his load of down feathers and layers of merino wool down the frigid Appalachian Trail during an astonishing winter thru-hike. Triple Triple Crowner Lint (No, that is not a typo, that denotes the completion of AT, PCT, and CDT three times each) has used the GG classic Spinnshelter for many thousands of miles. Gossamer Gear’s pioneering efforts into the ultralight backpacking industry have always encompassed debuting new designs and experimenting with the lightest, most durable materials to handle thousands of backpacking miles. 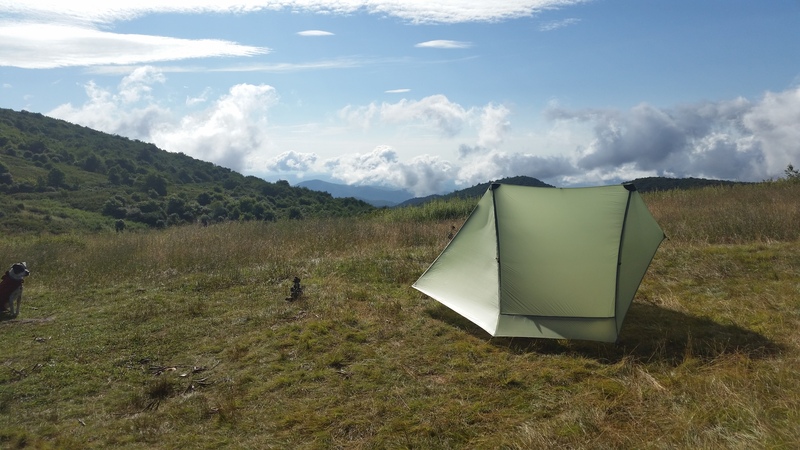 Most backpacking manufacturers utilize silicon impregnated ripstop nylon, or silnylon, in their shelters. The weight, waterproofness, and strength of silnylon varies by the shelter, but this popular fabric has been used for many years with much success. However, ultralight manufacturers have always been on the lookout for an even lighter alternative to silnylon. In the mid 2000’s, Gossamer Gear began producing shelters made with a special high count spinnaker cloth as a lightweight alternative to more mainstream silnylon shelters. The One was one of these shelters. 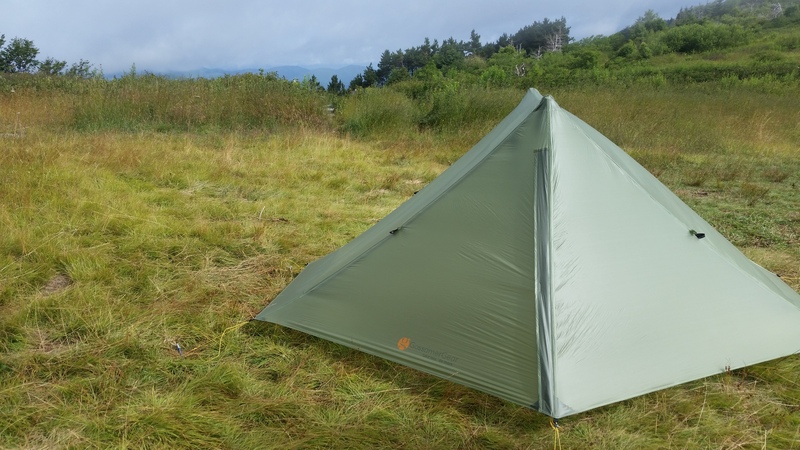 A single wall tent made with a 0.99 oz/yd spinnaker canopy, 0.7 oz/yd no-see-um mesh, and 70d 2.2 oz/ yd urethane-coated ripstop nylon reinforcements (2008), the One was an sub 20 oz shelter that provided full weather protection at a very light weight. 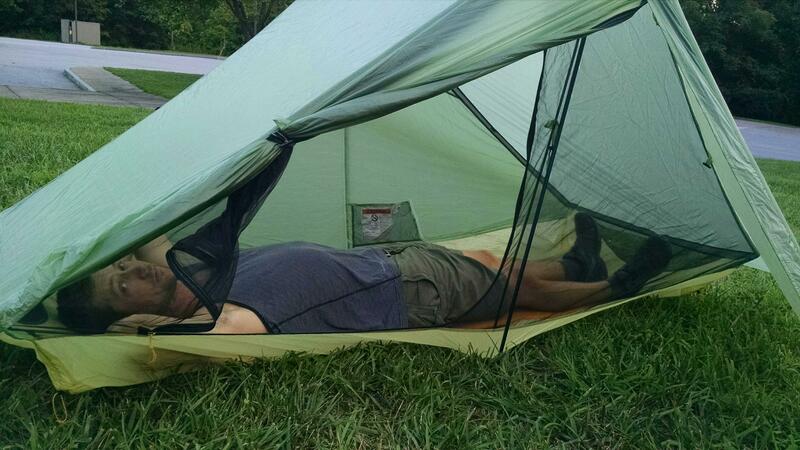 Despite the shelter’s popularity, the special spinnaker cloth that Gossamer Gear had developed became unavailable to source. As a result, The One, along with other popular designs such as the SpinnShelter, were discontinued. The redesign in intervening years has been good for The One. The major differences are of course, the exchange of silnylon for spinnaker cloth, a fully enclosed floor, and an improved ventilation system. Gossamer Gear has kept true to the weight of the original shelter, weighing in at an impressive 20 ounces with stuff sack. Tent body: Custom-formulated 7d high tenacity nylon blended sil/pu coating waterproof to at least 1200mm. Tent floor: Custom-formulated 10d high tenacity nylon blended sil/pu coating waterproof to at least 1200mm. I took The One into the High Peaks and Long Trails of Western North Carolina and Tennessee. Overnight temperatures averaged from the low to mid sixties (degrees Fahrenheit), with overnight humidity ranging from the low seventy to mid eighty percent. Conditions were generally wet, including patches of severe thunderstorms. Elevations ranged from 2500 feet to over 6000 feet above sea level. 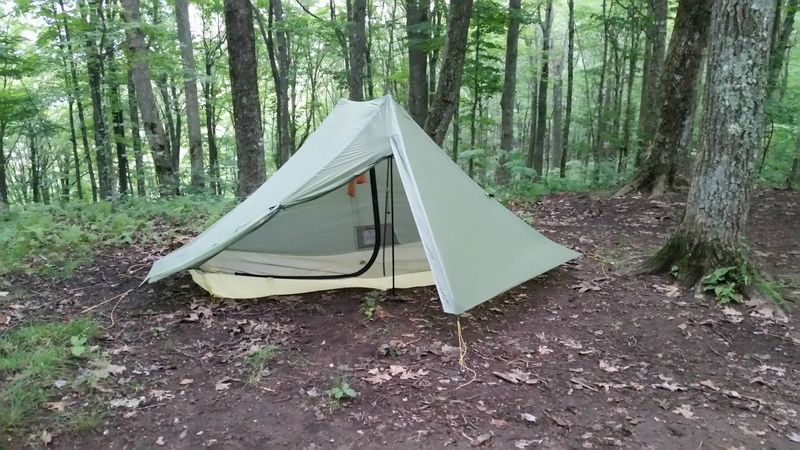 Gossamer Gear asked me to test out The One shortly before its release date (Thanks Ya’ll!). I was able to take The One out for an overnight before living in it for a week as a hiking and wilderness guide in the Southern Appalachians. 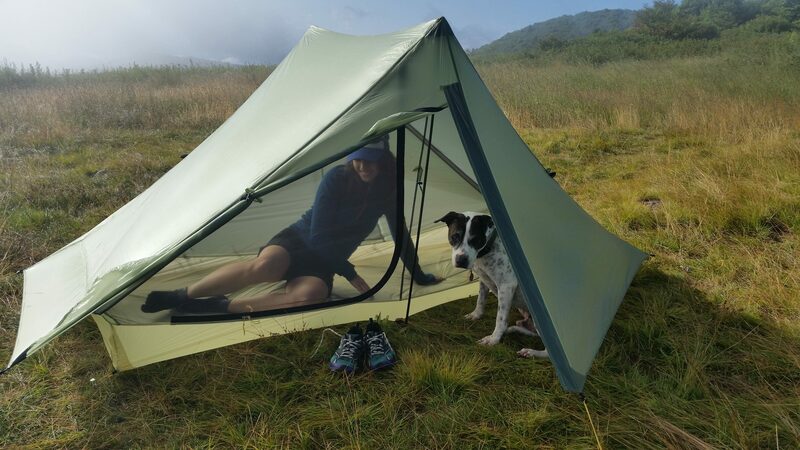 When pitching the tent it is helpful to be aware of the shape of the shelter. From the front, The One resembles your average pyramid shaped non freestanding tent. From the side and back of the tent however, the rear beak extends out from the sleeping area, providing a large vent for superior ventilation. Because of the angle of the rear beak, the rear pole is pitched at an angle – very important to keep in mind when setting up The One. The One’s canopy is pitched with six stakes. The bathtub floor, however, can be pitched with an additional four stakes. I gave it a whirl the first time, but fiddling underneath the canopy to get the perfect pitch for the floor, plus carrying an additional four stakes just isn’t worth it at the end of a long hard day at camp. After pitching The One, the first thing I noticed was its generous size. Although this tent is designed as a solo shelter, The One has more usable space than your average single person ultralight single wall tent. When pitched with 125cm poles, The One has a head height of 46 inches. This is enough room to sit up (up to 6’4″). But unlike popular pyramid tent styles with a single apex, The One provides ample shoulder room to stretch, cook, and forget you’re in an ultralight shelter for the night. 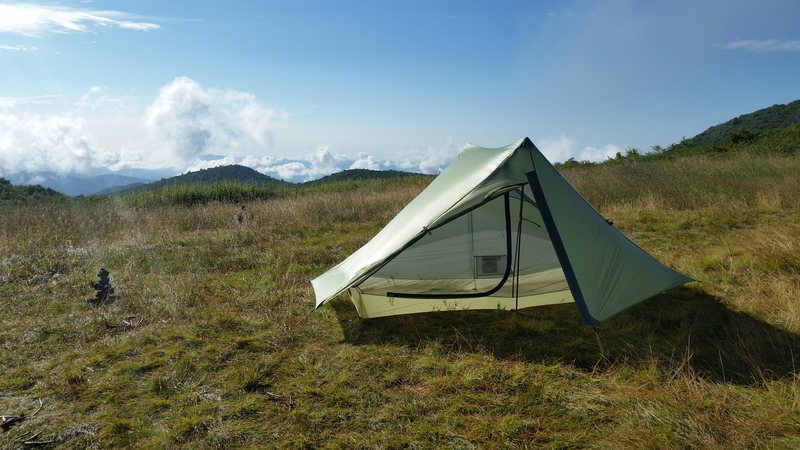 Also, unlike comparable ultralight single wall tent designs, The One’s angular canopy means that all 17.3 square feet of The One’s floor size is accessible, usable space. In addition to the ample interior, the vestibule is nearly as large as the floor at 16.2 square feet. One of the updated design features of The One is a much larger rear beak and mesh vent. Initially I worried about rain entering the tent via this rather large vent, but again, the angle of the vent seems to keep precipitation out of the tent. I’m not sure if the high canopy or the wide walls of The One kept me from coming into contact with any condensation, or if the improved ventilation system is just extremely efficient. Either way, the design of the tent keeps the user from experiencing the dreaded condensation single wall tents are known for. 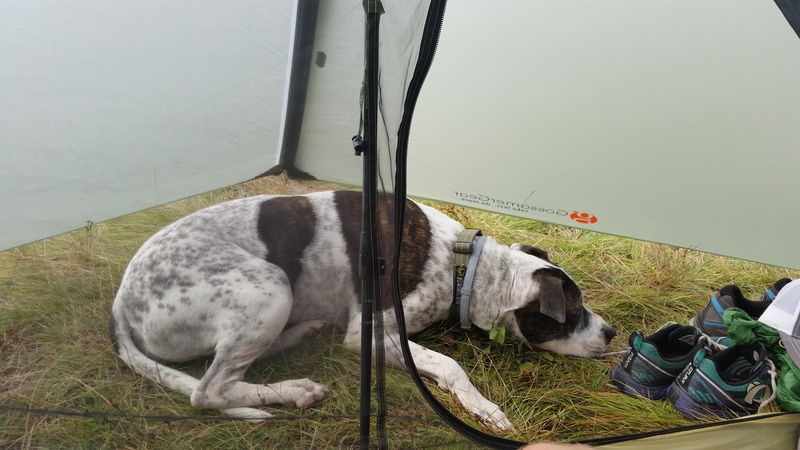 I experienced a deluge of rain and thunderstorms during my week of guiding with The One. My first night on trail, I set up The One in the dark during an intense thunderstorm. My headlamp shone on a big wet pile of muddy green and yellow silnylon. This intense weather was not only the perfect test for The One’s weatherproofness, but also its livability. In the few minutes it took to pitch the tent I was completely soaked from the southern thundershower. I have never had a shelter with an interior clothesline – I didn’t even know such a thing existed. As I changed out of my cold, wet clothes with ease in The One’s large tent space, I was grateful for The One’s interior clothesline. My wet clothes had a space to hang, and I slid my headlamp through the flashlight loop to make a makeshift lantern. Despite the deluge and my less than perfect pitch in adverse conditions, The One handled the heavy rain with ease. The bathtub floor (not staked down) kept me safe from the quickly pooling groundwater, the vestibule kept my gear dry, and no precipitation found its way into the tent via the rear vent. The One’s additional features make it feel like a tent rather than an ultralight single wall shelter. The already attached line locks and guylines make the tent easy to set up and adjust. The catenary cut makes The One easy to achieve a nice taut pitch. The One has not one, but two toggles to draw both the exterior canopy and interior no-see-um netting away from the tent for ventilation, views, or for entertaining. There is a large mesh internal pocket for storing headlamp, glasses, etc. There is an interior clothesline and flashlight loop. At $449.00, The One is an investment. It is made of durable materials with ample reinforcements. I am confident this tent would survive a thru-hike (or three). 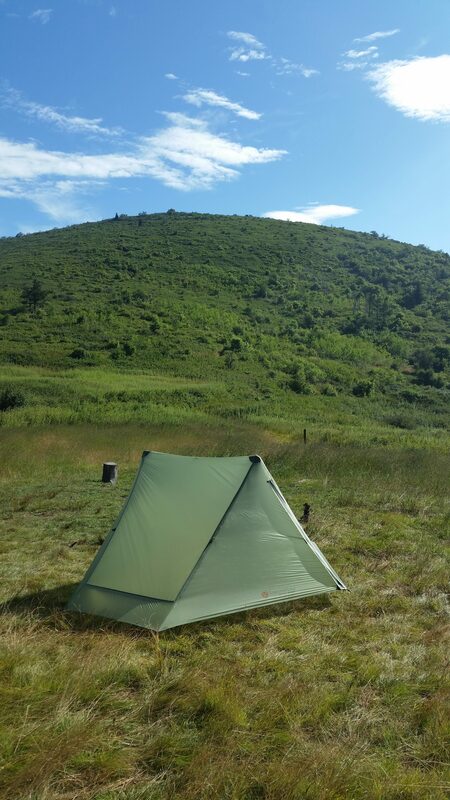 In the market of UL tarps, tents, and hybrids, the price point is high – but I am confident it is the right price for a well built, well designed silnylon shelter. 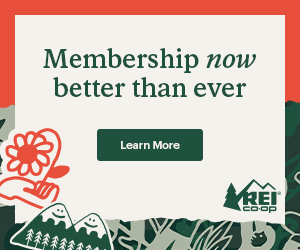 The One is perfect for the budding ultralight backpacker, or thru hiker who values creature comforts during long hikes. Everything about The One – from its generous design, rugged reinforcements, and small creature comforts is intentional. Gossamer Gear made a name for themselves in the ultralight world by counting every ounce – The One makes every ounce count. Disclosure: The One was donated for the purpose of this review. Awesome review of a shelter I’m now quite curious about. 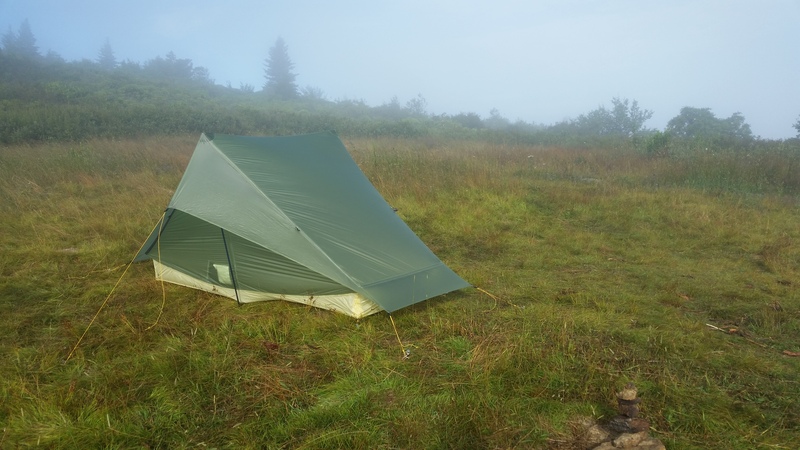 I encourage you to read some reviews of the original shelter – It was well used and well loved by many a hiker. The redesign has already become a fast favorite of mine. I think it’s going to be a classic! There are a couple big difference between the two. 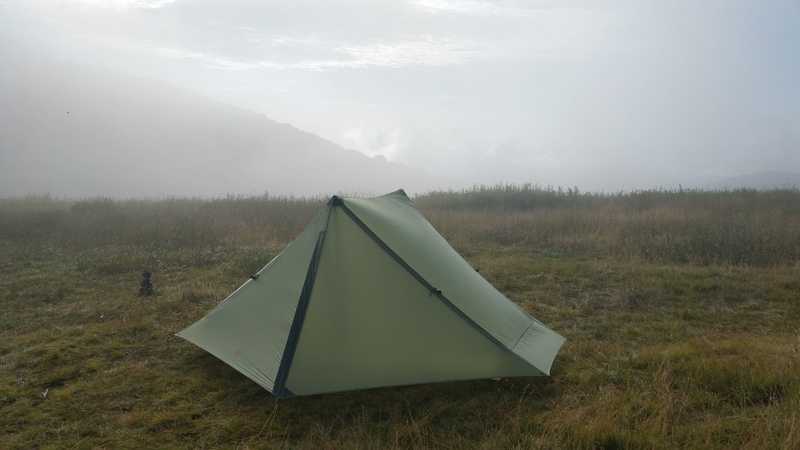 The One is a silnylon shelter – ZPacks use Cuben Fiber in their shelters. There are a host of comparable factors between the two materials. Cuben is lighter, does not absorb water, and does not stretch. However Silnylon is a more durable fabric. In my review I noted how reinforced The One shelter is – it is a shelter meant to last for many thousands of miles. ZPacks suggests at least one 2500+ mile thru hike, or more depending on the care taken with the shelter. The other big difference between The One and the Soloplex (and any other pyramid shelter) is usable interior space! Pyramid shelters have low angled walls which reduce usable interior space significantly (aka you can only sit up straight in the Apex of the tent)! If you look at the side profile of The One – you can see the front and rear poles are at the same height – all the floor space of inside of The One is usable. Would you recommend this even for winter camping in the pacific northwest? Can you please post a few photos of the packed size with a nalgene bottle or ruler for comparison?